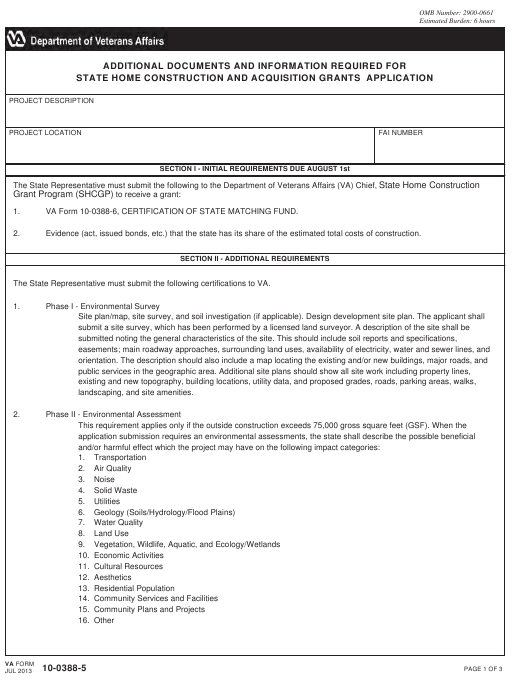 VA Form 10-0388-5 is a U.S. Department of Veterans Affairs form also known as the "Additional Documents And Information Required For State Home Construction And Acquisition Grants Application". The latest edition of the form was released in July 1, 2013 and is available for digital filing. Download an up-to-date VA Form 10-0388-5 in PDF-format down below or look it up on the U.S. Department of Veterans Affairs Forms website. VA Form 10-0388-6, CERTIFICATION OF STATE MATCHING FUND. Evidence (act, issued bonds, etc.) that the state has its share of the estimated total costs of construction. The State Representative must submit the following certifications to VA.
submit a letter noting a categorical exclusion, subject to approval by VA.
7. Technical engineering plans, including structural, mechanical, plumbing, and electrical drawings. MATTERS FOR PRIMARY COVERED TRANSACTIONS. REQUIREMENTS FOR GRANTEES OTHER THAN INDIVIDUALS. VA Form 10-0388-9, CERTIFICATION REGARDING LOBBYING. VA Form 10-0388-2, CERTIFICATION OF COMPLIANCE WITH PROVISIONS OF THE DAVIS-BACON ACT. provisions of 38 CFR 59.70. Advertisement for the proposed project and request for bids. Two copies of the itemized bid tabulations. Revised SF 424, SF 424c budget pages, based on the selected bids (including final cost for all items in the project). Three signed originals of the Memorandum of Agreement that includes provisions in the Sample Memorandum of Agreement. CERTIFICATION - THE LAW PR0VIDES SEVERE PENALTIES FOR WILLFUL SUBMISSION OF FALSE INFORMATION. I certify that the above information submitted to VA is true and correct to the best of my knowledge and ability. authorize a grant without a complete package. Your failure to furnish this information will have no effect on any of other benefits to which you are entitled.